A brief guide to cricket in the UK, including the main vocabulary used. Cricket is a game between two teams, each of 11 people, judged by one or two umpires. A toss of a coin is used to decide which of the teams bats first while the other team fields. Two batsmen stand in the middle of the field, holding a cricket bat and wearing pads, gloves and a helmet for protection. The batsman stands at a line called the crease which is marked in front of each of the wickets. A wicket is a set of three upright wooden posts called stumps (known as leg stump, middle stump and off stump), on the top of which two bails are balanced. The bowler runs up and throws a cricket ball towards the batsman at the opposite wicket. There are names for different types of throws (deliveries): for example, a full toss doesn't bounce before it reaches the batsman, and a yorker bounces close to the toes of the batsman. The same bowler makes 6 successive throws - this is known as an over. If one of the balls isn't bowled properly there may be an extra (an additional throw) - the different cases are a no-ball, wide, bye or leg bye. At the end of the over the fielders change ends but the batsmen stay where they are. After a number of overs a new ball may be used. The batsman who is facing the bowler tries to hit the ball towards the edge of the field (the boundary) and away from the fielders. The batting pair score a run each time that they both manage to run between the two opposite wickets. If the ball is hit over the boundary line it is called a four (4 runs are scored), and it is a six (6 runs are scored) if the ball reaches the boundary without first hitting the ground. Each batsman continues playing until he is out (his wicket is taken). One way this can happen is if he is caught by one of the fielders (the ball must be caught after it has hit the bat and before it has bounced on the ground). He may be run out if a fielder manages to hit the stumps with the ball while a batsman is running (his bat must be outside the crease). A batsman is also out if he uses his leg to stop a ball which would have hit the wicket, known as lbw (leg before wicket). He may also be bowled out if the ball hits the stumps directly. The decision about whether someone is out is made by an independent umpire. A fielder may make an appeal if he thinks the batsman is out, typically by shouting the word howzat ("How's that?"). When a batsman is out he leaves the field and is replaced by the next member of the batting team, until 10 wickets have been taken and the team is all out. The last batsmen are called tailenders. The time while a team is batting is called an innings. The score such as 154-3 is read "154 for 3" and means that 154 runs have been made for the loss of 3 wickets. At the end of an innings the fielding and batting teams change roles, and the new batting team tries to score more runs. Longer matches may have two innings for each team. Because the playing time is limited, a team that is scoring well may choose to declare, meaning that it finishes its innings before all of the batsmen are out. If the game is unfinished the result is a draw. If scores are identical the match is a tie. International cricket games played over several days are known as test matches. The main countries which play are England, Australia, New Zealand, South Africa, Zimbabwe, the West Indies, India, Pakistan, Sri Lanka and Bangladesh. A test match usually lasts for 5 days, with each side playing two innings (usually the teams alternate the innings, but if the second team scores over 200 runs fewer than the first team it must follow on, playing its second innings directly after its first one). The winner is the side with the highest total score in both innings (play stops as soon as a team cannot be beaten, and the match is a draw if there is not enough time to finish the final innings). Usually between 3 and 5 test matches are played, with the overall winner being the team which wins the most games. In one-day cricket each team has only one innings. Each team tries to score as many runs as possible in a limited number of overs (usually 50 overs). If two national teams are playing the game is called a one-day international or ODI. The Cricket World Cup is a one-day international competition which takes place once every 4 years: in 2015 it will be hosted jointly by Australia and New Zealand. The County Championship is an annual league competition between regional teams from England and Wales (teams are split into a first division and a second division and play each other in a series of two-innings games). 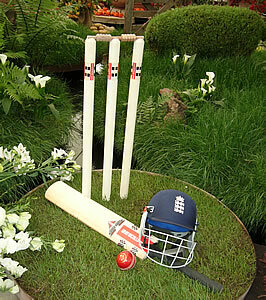 The Friends Provident Trophy is a competition based on one-day cricket games. There is also the Twenty20 Cup. Twenty20 cricket (also known as T20) is a recently created form of the game in which each team plays just 20 overs each. It lasts about 3 hours and is often played in the early evening. 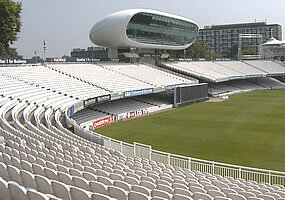 Some of the main locations for test matches in the UK are at Lords (near St John's Wood underground station in London), the Oval (near the Oval underground station in London), Headingley (near Leeds), Old Trafford (near Manchester), Edgbaston (near Birmingham), Trent Bridge (near Nottingham), Bristol and Cardiff. Every two years England play Australia in a contest known as the Ashes. England won the competition in England in summer 2009 and also won in Australia in the winter 2010/2011. Games are shown on subscription TV channel Sky Sports 1 (see: http://www.skysports.com/cricket/ashes), and commentary is available on BBC Radio 5 Live (see: http://www.bbc.co.uk/5live). The diagram below shows the names of some of the most common fielding positions on a cricket field. The position of the batsman who is facing the bowler is marked with an "X" (the second batsman stands at the opposite end). The circles represent the two sets of stumps, and the arrow shows the direction in which the ball is bowled. The onside is the half of the field which is on the left-hand side of a right-handed batsman (or on the right-hand side of a left-handed batsman). The other half of the field is called the offside. The areas close to the boundary are the outfield, while closer to the batsman is the midfield. The area directly between the two wickets is the pitch. The words long or deep are used for most of the positions in the outfield (the exception being third man). The word leg is used for the positions which are in line with or behind the batman's legs (not his bat). Silly describes positions which are just in front of the batsman. Mid is used for positions in the midfield. Mid on and mid off are close to the second wicket (onside and offside respectively). Fielders in the square positions stand in line with the batsman, while those in the fine positions cover balls which are hit behind the wicket. In the offside the positions in front of the batsman are known as gully, point and cover, and the slips are just behind the batsman (there may be more than one person standing here, in positions known as first slip, second slip, third slip and fourth slip). The wicketkeeper stands directly behind the batsman.